PART # S-226B LATCH. PART # S-226L CAM. 2 1/2" CUTOUT HOLE REQUIRED. 1/8"-3/4" PANEL THICKNESS REQUIRED. Pipe Deck Fill - 1-1/2" - Water. 316 S.S. 1-1/2" Pipe Water Deck Fill with Key. "Totally fast totally great! Superstar service!". Why choose Bumboat?. 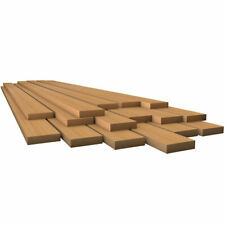 Whitecap 60812 Teak Lumber 1/2" X 1-3/4" 36"
Teak Marine Lumber. Length: 36". Teak Lock-In Four-Rod Storage Rack. 24"L x 1-3/16"H x 3-5/8"D.
3 Step Boat Ladder Stainless Steel Folding Ladder Polish 2 1 Step Pontoon Ladder. floor or side railings depending on the installation. The design of this platform ladder makes. Installation is very easy, simply bolt the ladder to ahorizontal platform and you are ready to. Boat part number 8103917 is a new locking T-handle latch from Whitecap Industries, part number S-226BLS. Commonly used on Legend Bass Boats, part number 205332. May be used on other boats. Part Manufacturer: Whitecap. 316 S.S. Gas Spring. 20" Gas Spring - 60lb - Stainless Steel. P1 Force - 60. Length - 20". Wall-Mount Paper Towel Holder. 1-7/8"H x 12-1/4"W x 4-3/8"D.
18" W (back), 17" W (front) x 15" D x 1-5/16" Thick. 316 S.S. 2" Push-Up Hose Deck Fill (Gas). Wish more were like this. "Totally fast totally great! Superstar service!". Boat part number 1029425 is a new pop-up cleat from Whitecap, part number 6809. Part Manufacturer: Whitecap. Part Number: 6809. We're your port for thousands of hard to find boat parts, original manufacturer's parts and marine surplus. Seven-Loop Handrail. Solid Teak Handrails. 10" Gas Spring - 40lb - Stainless Steel. 316 S.S. Gas Spring. Length - 10". Teak used is 100% genuine natural growth Asian teak and not to be confused with plantation teak. Plantation teak’s average growth is 20 years (a big reason why it has much softer grain, of lesser quality and not suitable for all applications) compared to 80 years for natural growth teak. 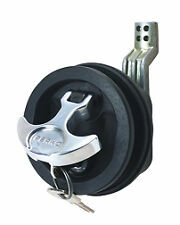 Mini Ring Pull Nylon Locking Black. Mini Slam Latch. Two-Tier Spice Rack. Holds up to 6 standard spice bottles on each self. Commonly used on Lowe Boats. Can be used on other boats as well. Latches are dirty. Boat Manufacturer: Lowe Boats. Hosts a T-handle. Cam is not included. Material: Marine Grade Plastic (Housing) / Stainless Steel (Hardware). Slam Latch. Stainless Steel. Depth: 1-1/2". 90° Elbow - Rail Fitting. Weight: 6.5 oz. Material: 316 Stainless Steel. Boat part number 1029440 is a new spring loaded pop up cleat from Whitecap, part number 6810. Part Manufacturer: Whitecap. Part Number: 6810. We're your port for thousands of hard to find boat parts, original manufacturer's parts and marine surplus. Whitecap 1 in. Hose Barb 316 Stainless Steel Thru Hull1 7/8 in. flange1 1/8 in. thread length2 1/2 in. overall length1 1/2 in. max hull thickness. Barb 316 Stainless Steel Thru-Hull 6542. Whitecap 6542 Thru Hull. Compression Handle CP Zamac/White Nylon Locking Fresh Water Use Only. CP/Zamac/White Nylon Locking Compression handle. For Fresh water installation only. Has a keyed lock. Whitecap 6223C Hawse Pipe 316 Stainless Steel 1-1/2" X 3-3/4"
Hawse Pipe. Material: 316 Stainless Steel. Pipe Depth: 7/8". RUBBER TOGGLE BOOTS. FITS STANDARD TOGGLE SWITCHES. Whitecap 60714 Teak Louvered Insert 6-3/8" X 11-3/16" 3/4"
Teak Louvered Insert. Width: 10-3/16". Height: 5-3/8". 28" Gas Spring - 120lb - Stainless Steel. 316 S.S. Gas Spring. Ext length - 28". "Totally fast totally great! Superstar service!". Why choose Bumboat?. Rubber Spreader Boot - Pair - Small - White. White Rubber Spreader Boot. Small Spreader Insert: 1/2" - 1-1/2". Height: 2". Length: 1-5/8". 316 stainless steel. Step Size: 4 3/8" X 2 1/8". New in sealed bag. Of 316 S.S. Bow Chocks. Material: 316 Stainless Steel. Weight - 8.0 oz. Marine Grade. MATCHING KEY INCLUDED. BLACK NYLON/BLACK ZYMAC CONSTRUCTION. Nylon Body and CP Zamac handle non-locking T-Handle latch. Nylon body is white. Normalized SKU: 3226BC. T-Handle Latch - Nylon Black/Black - Locking. Shaft is 1-3/8" long unless otherwise noted. Fastener: Included. Surface Depth: 1/8" - 3/4". Cut-Out: 2-1/2". Trending at $29.75eBay determines this price through a machine learned model of the product's sale prices within the last 90 days. 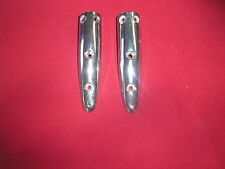 Boat part number 1029424 is a NEW out of the box, 4 3/4" stainless steel lift up cleat from Whitecap, part number 6804. Cleat has an approximate 3/4" clearance when in up position. Hardware and instruction / installation manual not included. Whitecap 6844C Folding Cleat Stainless Steel Studded 4-1/2"
Folding Cleat - Stainless Steel Studded - 4-1/2". Cleat Length: 4-1/2". Depth: 1-5/8". Chain & Rope Deck Pipe. Normalized SKU: 6033. Pipe Deck Fill - 1-1/2" - Water. 316 S.S. 1-1/2" Pipe Water Deck Fill with Key. Weight: 20oz. Fastener: #10 (3). Whitecap's Locking White Nylon T-Handle. Locking Nylon T-Handle - White/White. Surface Depth: 1/8" - 3/4". Type: Diesel. Angle - 90 degrees. Requires Fastener: 3 @ size #10. Rubber Spreader Boot - Pair - Large - White. White Rubber Spreader Boot. Large Spreader Insert: 2" - 3". Height: 7-1/2". Length: 2-7/8". Strap Hinge - Pair. Material: Polished Brass. Fastener: #10(6). Taco Marine Stainless Steel 316 Boat Sailboat 60 Degree End Stanchion 7/8"
Whitecap 6080 Stainless Steel 316 Boat Sailboat 120 Degree End Stanchion 7/8"